Some of us have talked about our first cookbook as children. I think it would be interesting to share the cookbooks we used after we flew the coop. I’ll start - it was Great Dinners from Life and Time Life series of Foods of the World. I never had a " fail" from Great Dinners from Life. Still look through it from time to time - gorgeous photography. I can’t recall if it was the first one I bought, but the first significant one was Delia Smith’s “Complete Cookery Course”. It was first published in 1978 (six years after we got married). We still have a copy (not the original - that fell apart from use) and, whilst, it’s fairly rare that I use it for recipes these days, it’s still the book I’d first look at for a “how to…” question. I’ve had my first cookbook to this day since before college circa 1980: Better Homes & Gardens New Cookbook. That’s a good book, but in a pretty utilitarian sense, like proportions for a pancake batter. like proportions for a pancake batter. I don’t make pancakes at all often - and it’s that original book that I still refer to for measurements. And suet dumplings for stew. James Beard’s American Cookery. It remains one of my favorite cookbooks. NY Time Cook Book - Craig Claiborne. There were two volumes. And, Mastering the Art of French Cooking. Good Food Guide Dinner Party Book:Recipes from the restaurants featured in the Good Food Guide, Great Britainin the late 1960s and 1970. Like many people, the web is pretty much my only source these days. I have a laptop almost permanently on when I’m in my kitchen. John - The only attribution I can remember was the excellent curried parsnip soup by Clive Imber, but I can’t recall where he was at the time. I’ll try to track it down next weekend. 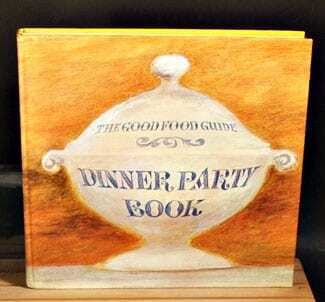 The first book I remember cooking from as a kid was part of my parents’ collection, a Frugal Gourmet tome. However, when I got my first apartment, my mother sent me off with two books - first, the Joy of Cooking, from which I don’t think I’ve ever made a single actual recipe but did prove to be a valuable reference in the pre-internet days, and a binder full of her recipes, the things I had grown up eating. Luckily she typed all of these up and saved them to a floppy disk, so I was able to save them to the hard drive of my first computer, and those files have been with me ever since (the binder itself is long gone). I still refer to those files frequently, but I also sometimes just call my mom when I want to make one of her specialties. I hope to have that luxury for many years to come, but one never knows. Mrs Balbir Singh’s Indian Cookery. The book was used by my mother and each of her sisters. I took it to Edinburgh with me. The first cookbook in my memory was my mom’s copy of Better Home & Gardens, and it was the first cookbook I bought for myself when I had my own kitchen. I still use it occasionally. Joy is niw my go-to…I am on my second copy because I loved the first one too hard. Still trying to figure out the adult part. “The Thrill of The Grill” by Chris Schlesinger and John Willoughby had a formative influence on me as a young adult, and it continues to inform how I cook today. This book introduced me to a lively, fresh approach to cooking—say, a fresh salsa over fish—with big flavors brought by the ingredients themselves. I used this book much less for grilling and much more for its techniques, sides, and desserts. Various salsas, the liberal use of fresh herbs, fresh fish, the cold orzo salad, chocolate pudding cake, and chocolate pecan pie made their way into the repertoire at our house. I was also won over by the generosity of the recipes: At the time, Chris Scheslinger was chef-owner of the late, great East Coast Grill in Cambridge, Massachusetts. You could experience the flavors of the restaurant at home by following the recipes. This book set a high bar, and it’s what I want to this day from any cookbook I buy. The recipes need to work, they can’t have a lot of (pricey) ingredients or fussy techniques, and I want to learn something beyond the recipes themselves. Nor do I want to pile up a mountain of dishes to do the prep. These qualities are still what I appreciate about a great physical cookbook, which go beyond individual recipes that I can browse online. 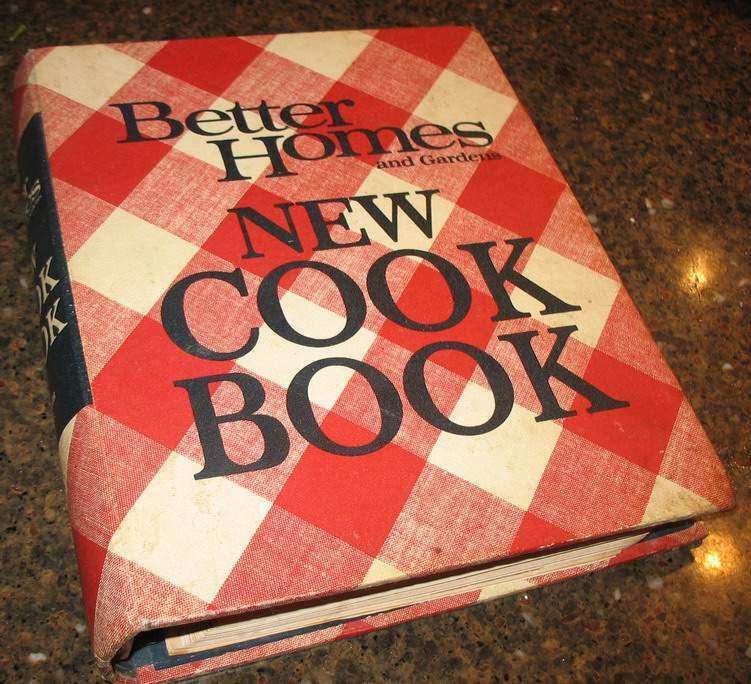 My Mom gave me the 1976 edition of the Better Homes & Gardens New Cookbook when I was 17 (before I had moved out of the house), so that was my first one. It’s a good “starter” cookbook. I still have it and still use the pie crust, apple pie and chili recipes. World Vegetarian by Madhur Jaffrey. I was never actually vegetarian, but when I wanted to get a little more creative with cooking vegetables, this was the book I got. World Vegetarian by Madhur Jaffrey. I’ve several Jaffrey books, all in fairly regular use. The earliest is “Far Eastern Cookery” from 1989. It accompanied a TV series. Thanks - I’ll look for it!